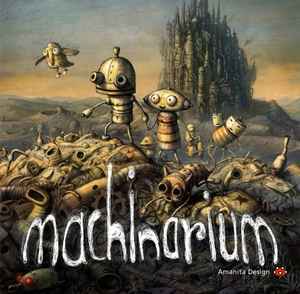 There are no words "Machinarium Soundtrack" on the title cover, but it's real title. - 405 numbered copies on black. - 245 numbered copies on black (this). - 500 copies on black. Each copy contain three art reproductions by Adolf Lachman and features a coupon with a code to download MP3/FLAC versions of the album. Download also contains Tomáš Dvořák - Machinarium Bonus EP. This is a beautiful record in every way. The game and artwork by Amanita is fantastic and the music by Tomas Dvorak (Floex) is truly sublime. Very happy to have picked up number 219/245 from this reissue.